Continuing the legacy of #MondayMotivation, this time it’s something very different for the audience and because the Winter is here, we are with something from Game Of Thrones Season 8 Episode 1. 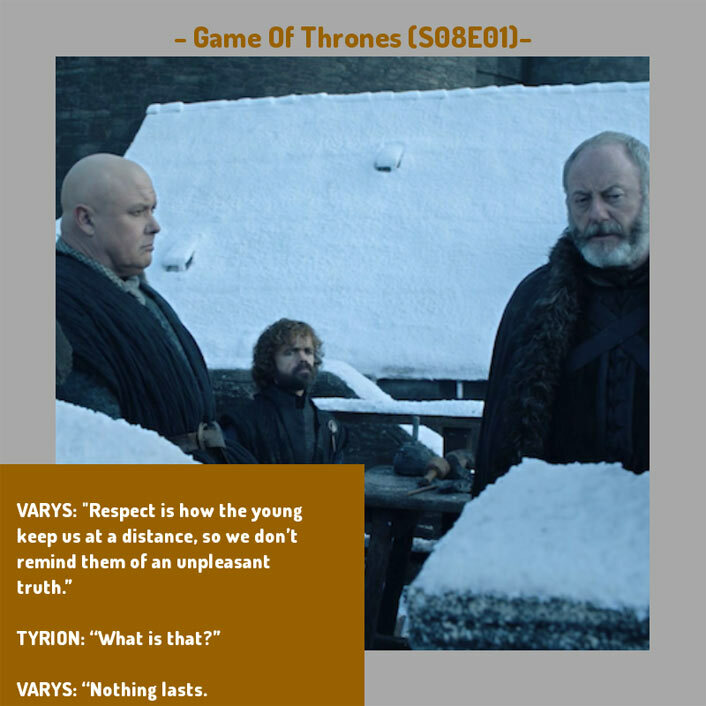 #MondayMotivation: This Dialogue From Game Of Thrones 8, Episode 1 Teaches A Very Important Life Lesson Lord Varys is known as the master of words as he knows how to manipulate a situation by taking anyone in the web of his talks. In the first episode, he gives this very important life lesson of ‘nothing lasts’. With a storyline that paints a whimsical world of dragons and White Walkers on the one hand, and stays close to reality by showing how relationships cannot be trusted when it comes to ruling a kingdom, the show has become a global phenomenon. The show, based on George R.R. Martin’s novels, is about the quest to claim the Iron Throne. But it also stands for complicated political gambits, scheming and the backstabbing nature of people and finding love in troubled times. The last season premiered internationally on April 14. It aired in India on Star World today. Maisie Williams and Nikolaj Coster-Waldau find the buzz around the plot of the final season of “Game of Thrones”, crazy. “I remember having a little braid in my hair and the hair and make-up team would be like, you cannot leave with that braid in your hair, we have to take it out,” Williams said in a statement. * “Because people will read into it and find some spoilers with just a braid. It’s crazy,” added the actress, who essays Arya Stark in the fantasy series. The post #MondayMotivation: This Dialogue From Game Of Thrones 8, Episode 1 Teaches A Very Important Life Lesson appeared first on Koimoi.